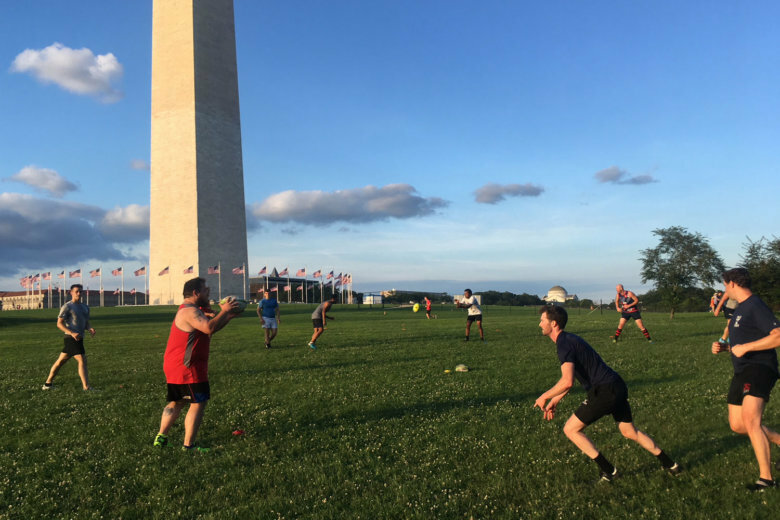 The Washington Renegades have been offering an inclusive environment to play rugby in D.C. for 20 years, becoming pioneers in the International Gay Rugby community. WASHINGTON — Chris Adams is straight. It’s the kind of descriptor we rarely bother assigning — assuming it as the default — particularly in the sports world, and even more so in an alpha male, contact sport like rugby. Adams was a military kid who played college rugby at UConn, where the sport appears as most in America know it — very straight and very white. When he moved to D.C. for a job in 2011, he finally had the right combination of circumstances — including both free time and health insurance — to pick the game up again. But he found a different kind of club than those he grew up around, which he connected with on a deeper level than just the sport itself. The Washington Renegades are an inclusive rugby union football club whose mission is to teach the game and celebrate differences across age, race and orientation divides. They compete as a part of USA Rugby, just like any other amateur club. But they were also pioneers of what has become a parallel, inclusive rugby culture that has spread around the world. Originally established back in 1998, the Renegades turn 20 this fall. Along with the San Francisco Fog, they were one of the first such clubs, of which there are now more than 80 worldwide under the banner of International Gay Rugby (IGR). The Renegades recently returned from the Bingham Cup, a biennial tournament named after Mark Bingham, a founding member of the Fog who was one of the passengers that helped divert Flight 93 on Sept. 11, 2001. The Renegades fielded three teams at this year’s event in Amsterdam, which included more than 70 teams. Homophobia and anti-gay rhetoric are still common in many team sports in America, as we’ve been reminded of this summer through old social media posts from Major League Baseball players. Michael Sam being drafted into the NFL as an openly gay man seemed to be a watershed moment, but the negative reaction to the news was still fierce, and he never saw the field in a regular-season NFL game. That makes the success of the Renegades particularly notable. Rugby is the closest sport we have to American football, both in terms of gameplay and perception as a hard-hitting, masculine sport. It also suffers from some of the same reactionary rhetoric. But he says he’s seen it improve in his seven years with the club. “We’re obviously not there yet, but it’s certainly better. Now, we as a team, people look across the field and see opponents on the rugby team, and they’re not worried about people’s sexuality and how they carry themselves,” he said. Of course, as in all sports, winning helps, not just to sustain interest, but to gain respect. That’s not the case anymore. While they’ve had plenty of success within IGR competition, they’ve also won championships at the D3 and D4 club levels, and made the USA Rugby Final Four a few years back. That’s helped them gain respect, and helped spread the word, particularly in this area. “Interestingly, International Gay Rugby is well represented in the mid-Atlantic region,” said Kieloch, noting that five of the eight teams in the mid-Atlantic Division D4 division are IGR teams. Last year, the USA Rugby Mid-Atlantic Division 4 championship was played between the Renegades and the Philadelphia Griffins, marking the first time that two IGR teams competed for a USA Rugby championship. Kieloch believes strongly that the foundation of inclusivity is what’s led them to this success. Adams understands that a lot of people still look at rugby as something more of a curiosity than a serious sport. “To a lot of people, rugby is like Bigfoot — everyone’s heard about it, but no one’s ever actually seen it,” he said. But he thinks what the Renegades have built can serve as a model for any sport to follow to be more inclusive even, yes, football. The Renegades practice twice weekly and field several teams, but are always looking for more members. To learn more about the Washington Renegades, check out dcrugby.com.